Thank you for the great hospitality you and your family provided when CBF executive members attended the 2006 National Broomball Championship in Carleton Place and stayed at your Inn. You assured our comfort and relaxation after the long days. It is not often I am able to extend my appreciation to hotel management but in your case, it was a must. 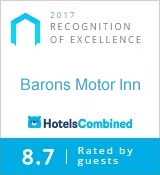 I look forward to returning someday in the near future to again enjoy the Barons Motor Inn. Without a doubt I will highly recommend your property to anyone travelling to Carleton Place who may require accommodation. I stayed at the Baron’s Motor Inn for almost three months while working on a contract in the Carleton Place area. You provided a large, clean room for my stay and I found the place quiet, respectful and particularly clean. I really appreciated access to the laundry room and you graciously provided a microwave for my use. You will no doubt remember that I worked 12 hours per day, 7 days per week and so I didn’t get much night life. However, it was nice to see a friendly face every time I came ‘home’ to the inn. Thanks again for great stay and for sure I’ll return in the future. Chad Sylvester, W.E.S. Consulting Inc. When I had to check out a day early my reservation was adjusted without question. I inadvertently left my cell phone charger plugged in and before I had time to leave the parking area was alerted and the unit brought to me. Where else would you get service like this???? Thank you. Will be back.